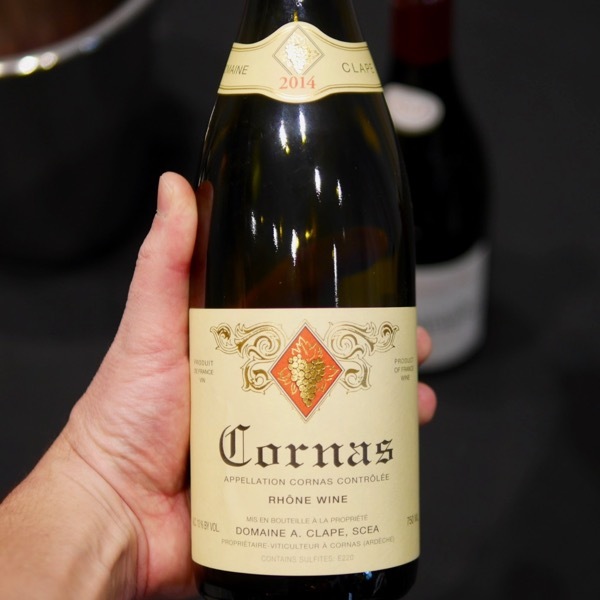 A Pair of 2014’s from the Rhône Hermitage vs Cornas … JL Chave vs A Clape + 2 Late Additions! Listen to a narration of the offer. A year later in Prevelly Park in Margaret River, I picked up a bottle of JL Chave Hermitage Blanc, I can’t recall the year. Needless to say, once again, mind blown! This is without a doubt one of the greatest Marsanne \ Roussanne blends of the world. Just like the Rouge, it is a rich, ripe wine, somehow, it remains elegant and refined. Complexity, seamless layers, and, incredible texture are words that I find myself repeating again and again with these two producers. Today we offer the 2014’s from both August Clape and JL Chave! These are in the top dozen Shiraz wines made in France. Tasted in components: #1, from Peleat: Vibrant red and dark berry character, along with intense floral and mineral nuances and silky texture. #2, from Beaume: Heady, smoke- and spice- accented dark berry and floral pastille qualities, plus a round, supple texture and repeating floral character on the back half. #3, from l'Ermite: More structured and powerful, showing intense dark fruit character and notes of olive and licorice that build with air. #4, from Le Méal: Exotic spices and candied flowers on the nose, along with bright red and dark berry qualities. Sappy and focused, displaying excellent depth and no excess weight. #5, from Bessards: Gorgeous, expressive floral pastille, incense and ripe dark berry scents and flavors. Weighty yet lithe, showing excellent focus and building sweetness. The final blend should be a beauty, combining dense, sweet red and dark berry fruit character and the freshness to buffer it. This starts strong, with warm ganache, steeped fig and crushed blackberry flavors, then gains steam, picking up smoldering charcoal, bay leaf and juniper accents as this drives and expands through the finish. Offers a long echo of graphite, with the fruit keeping pace. Very impressive for the vintage. Tasting his 2014 took me back to the 1983 Doc gave me. The personality was there! Such a beautiful core of fruit, layered in with spice and such complexity. Long even tannins dancing along your tongue, flavours that lingered long after the last drops had passed your tongue. A beautiful floral lift. Poised, balanced, delicious. Solidly packed, with a bramble-edged core of dark plum, bitter cherry and black currant fruit, inlaid with bay leaf and savory notes. The serious chalky grip through the finish will need some time to stretch out. Shows terrific interplay between the grip and fruit. While this is not as strong a year as the 2014, we’ve haggled the price down to reflect this. As with all of the great wineries, Clape, has done an made a delicious wine. Dense, with a impressive tannic coating to the chestnut, tobacco, pastis, mulled currant and blackberry fruit flavors. There's a smoldering charcoal note on the finish, with the grip nicely integrated. You'd never guess this as a 2008. A terrific effort for the vintage. Best from 2012 through 2022. Deep ruby. A complex bouquet offers raspberry, cherry pit, violet and spice cake, with an intense mineral quality. Deeper, darker fruits on the palate, along with suggestions of allspice and licorice pastille. Shows fine-grained tannins and tangy mineral spine, with a suave blend of richness and vivacity. The very persistent finish is taut and focused, with lingering licorice and spice nuances. Fresh, with a bright violet note out front, backed by racy red currant and bitter plum fruit flavors. Lots of chalk and savory details underscore the finish. Still tight, so cellar for a bit.